Read the blog posts, learn, add to your Biblical knowledge, and share with others. In 2019 the Christian Church in the Western world will celebrate Palm Sunday on April 14 and Resurrection Sunday a week later on April 21. “Easter” as it is commonly known (I confess to disliking the term, and prefer "Resurrection Sunday"), is an annually moveable holy day. March 21 is the earliest date, while April 25 is the very latest for the celebration. The rules for determining the actual day each year are complex and hardly known to Christians anywhere. So complex in fact, that most pastors quickly forget the formula shortly after studying it in Bible College, Seminary or Divinity School. The following brief explanation will make the point. “The rule has since the Middle Ages been phrased as “Easter,” and observed on the Sunday after the first full moon on or after the day of the vernal equinox. However, this does not reflect the actual ecclesiastical rules precisely. One reason for this is that the full moon involved (called the Paschal full moon) is not an astronomical full moon, but an ecclesiastical full moon. Another difference is that the astronomical vernal equinox is a natural astronomical phenomenon, while the ecclesiastical vernal equinox is fixed at March 21. Easter is determined from tables which determine Easter based on the ecclesiastical rules, which approximate the astronomical full moon.” “In applying the ecclesiastical rules, the various Christian Churches use 21 March as their starting point from which they find the next full moon, etc. 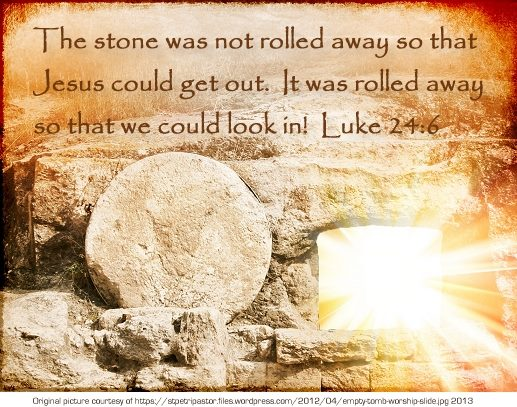 However, because Eastern Orthodox and Oriental Orthodox Churches use the Julian Calendar as their starting point, while Western Christianity uses the Gregorian Calendar, the end point, the date for Easter, may diverge.”* WHEW! No matter the actual date, for Christians everywhere the annual commemoration of the passion and resurrection of the Lord Jesus Christ is the most holy of all Christian celebrations. The celebration of the pre-resurrection Lenten season, and the post-resurrection ministry of Jesus the Messiah, helps us to focus our attention on this great validating epoch of the incarnation of our Lord Jesus Christ. These all point toward the present and future blessings that His resurrection makes possible for the redeemed of all the ages. "He has risen, just as He said" (Matthew 28:6a). *See this above cited source for more detailed information. (http://en.wikipedia.org/wiki/Easter).